August, the favourite month of schoolchildren everywhere. Unfortunately, the Sun doesn’t set until ten o’clock so the sky doesn’t get dark until really late. Still, with no school tomorrow, we can stay up late anyway, can’t we? Looking west into the glow of sunset, we can still see the planet Mars, much fainter now and getting tricky to spot. 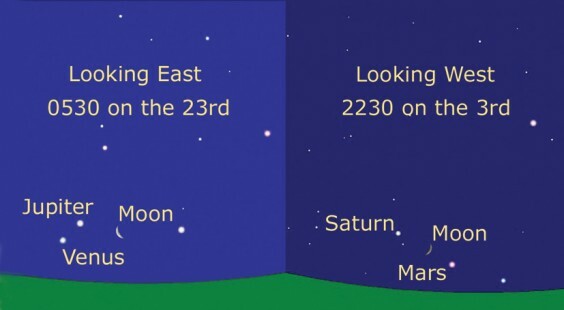 Try looking on the 3rd of the month when a crescent Moon is close by just to the left of Mars, with Saturn at the same distance to the left of the Moon. These two planets are with us for the whole month but never very high above the horizon. As each day goes by, the relative motion of the Earth and Mars will make the Red Planet appear to wander eastwards across the sky so that on the 24th it will be directly below Saturn. On the last day of the month, the Moon, having completed an orbit of the Earth, will again be close to Saturn but this time it will be very close indeed. The Moon’s orbit is the cause of another interesting effect this month too. If you imagine it to be an ellipse, the Earth is not at the very centre, so the Moon is sometimes slightly further away and sometimes slightly closer. The off-centeredness isn’t fixed but slowly rotates so that the phase of the Moon is different at each closest point (called the perigee by clever people). So, very occasionally, the Moon is full when it reaches this closest point and this is true for August this year. It happens on the 10th, so I want everyone to make a special effort to observe it and see if it lives up to the title of “Supermoon“ (recently adopted from across the Atlantic, I believe). Sadly, if you were hoping to catch what I think is the best meteor shower of the year, you may want to give the Moon another name as the Perseid shower is just two days later on the 12th. If you are sitting out during the evenings anyway, it is still worth keeping an eye on the sky because some of these meteors are very bright indeed. If you have to forgo the simple pleasure of late-night meteor spotting because you have to be up early for work, don’t worry because you are in for a treat too. In fact it will be worth everyone getting up early to see it. From about half past four in the morning, Venus is visible all month, low in the northeast, with the other bright planet, Jupiter, close by. To start with, Venus is above Jupiter, getting closer day by day until the 18th when they are very close indeed. From then on Jupiter is higher and, on the 23rd, a thin crescent Moon is nearby with the bright star Procyon just visible to its right. A grand spectacle, worth the effort of getting out of bed at five o’clock, don’t you think?